Hey there trendsetters! Now that a new season is rolling around, we want to share some cute and fun styles and trends that we are loving. Something to keep in mind when styling your wardrobe for the fall is to take the trends and make it your own. Just because these are the trends we see in magazines and in stores doesn’t make it the only items you have to wear. Take the style and add your own unique twist. 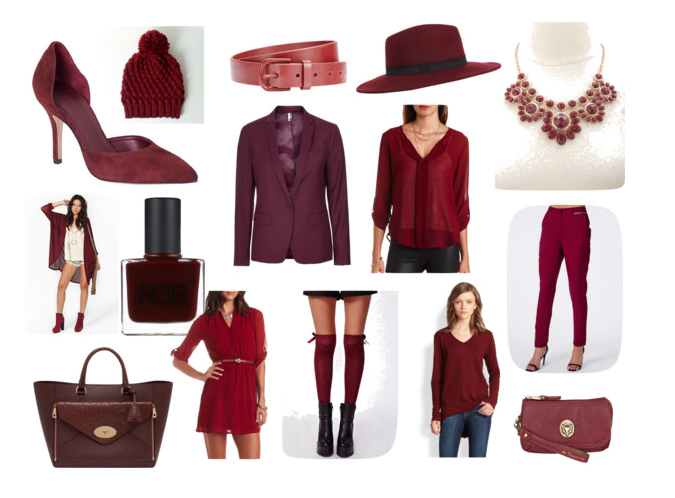 Let’s start off by introducing the color of the season which is oxblood. This is an absolutely gorgeous deep shade of red that compliments practically every skin color. This color is all over the magazines and is gracing the mannequins in store front displays. This is a beautiful shade that catches peoples attention, but it’s not too overwhelming. It’s a sublet shade that’s not too obnoxious or in your face. Not crazy about the color? That’s ok! Use it in your accessories or bag…it doesn’t need to be the focal point of your outfit. Categories: Fashion | Tags: blog, boots, coats, fall, fashion, metallic, oxblood, style, themakeupmovement, trendss, website | Permalink.